Trampled By Turtles is an American bluegrass/folk-rock band from Duluth, Minnesota. The band members have mentioned as inspirations Townes Van Zandt, Bob Dylan, Neil Young, The Rolling Stones, Nirvana, and Ralph Stanley. They have released eight full albums, three of which have reached US Billboard chart number one spots. Their fifth release, Palomino, maintained a position in the Top 10 on the bluegrass charts for 52 straight weeks. Their latest album, Wild Animals, was released on July 15, 2014. They have played internationally and at many popular music festivals in the US, and as of July 29, 2015, have played live in every state except Hawaii. Simonett, Saxhaug, and Young also play in a side project called Dead Man Winter. Young fronts The Fiddle Heirs and continues to collaborate with Pert Near Sandstone; he contributed to their cover of The Beatles classic "I Am the Walrus". The band has performed at many national festivals including Coachella, Bonnaroo, Stagecoach, Hardly Strictly Bluegrass, Bumbershoot, and Pickathon. In 2011, they performed at several large folk music festivals such as Telluride Bluegrass Festival, Newport Folk Festival, Floydfest, Pilgrimage, and ROMP roots and branches. They played at San Francisco's Outside Lands Music and Arts Festival, the Sasquatch Festival, Bonnaroo, Lollapalooza, Austin City Limits Music Festival, Firefly Festival, Rock the Garden, All Good Music Festival and the Newport Folk Festival in 2012. 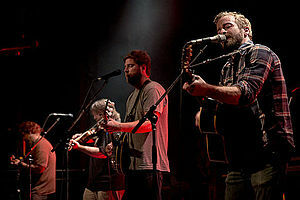 Trampled By Turtles made their national television debut April 24, 2012 on Late Show with David Letterman. They would return to the Late Show with David Letterman on July 16, 2014 to play songs off their Wild Animals album. Their single, "Are You Behind The Shining Star?" was featured in The Troubadour's Road Top 25 Songs of 2014. Their music has been featured in TV shows including Deadliest Catch and Squidbillies. Their song "Alone" was featured at the end of the 2013 movie The Way Way Back. ^ Gokhman, Roman. "Trampled by Turtles". Bay Bridged. Bay Bridged. Retrieved 25 August 2012. ^ "Future Releases on Triple A (AAA) Radio Stations". All Access Music Group. Archived from the original on June 21, 2014. ^ "CMT : Videos : Trampled by Turtles : Are You Behind the Shining Star?". Country Music Television. Retrieved June 22, 2014. ^ "Outside Lands 2012". Lineup.sfoutsidelands.com. Retrieved 2012-08-03. ^ Saunders, Hilary. "Watch Trampled by Turtles on the Late Show with David Letterman". Paste. Paste. Retrieved 25 August 2012. ^ Lammers, Tim. "Trampled by Turtles returns to David Letterman's Late Show". BringMeTheNews. Retrieved 17 July 2014.